HERDSA Guides provide useful ideas and information on many aspects of teaching and learning. Written by experts in specific fields, they are short, inexpensive and easy to read. The HERDSA Guides Editor and Editorial Committee review proposals for HERDSA Guides and other occasional publications and supports and advises authors in the writing process. The Guidelines for Authors page provides information for authors of guides and other relevant information pertaining to the publication process. HERDSA seeks authors to propose new Guides to add to the series. 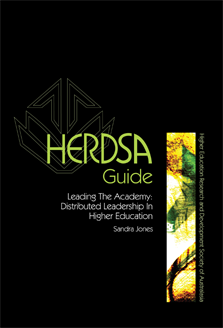 HERDSA Guides are intended as a resource that will assist in the enhancement of the management, curriculum development, teaching and learning practices within the tertiary sector. The Guides are relatively short, inexpensive, easy to read manuals which provide pragmatic ideas for immediate use. Other, according to interest areas/expertise of individual authors. Proposals should be submitted as email attachments in the form of Word files to the HERDSA office: office@herdsa.org.au. In the subject line please write Guide Proposal - surname of the first author. Submitted proposals should not be concurrently being considered by another publisher.